Although reflexology is not used to diagnose or cure health disorders, millions of people around the world use it to complement other treatments when addressing conditions like anxiety, asthma, cancer treatment, cardiovascularissues, diabetes, headaches, kidney function, PMS, and sinusitis. Whatever the approach, the reflexologist attempts to release congestion or stress in the nervous system and balance the body’s energy. How does reflexology relate to other therapies? Acupuncture and Acupressure: Reflexology is similar to acupuncture and acupressure in that it works with the body’s vital energy through the stimulation of points on the body. However, acupuncture/acupressure points do not always coincide with the reflex points used in reflexology. Massage: Some people confuse reflexology with massage. While both massage and reflexology use touch, the approaches are very different. Massage is the systematic manipulation of the soft tissues of the body, using specific techniques (for example, tapping, kneading, stroking, and friction) to relax the muscles. Reflexology focuses on reflex maps of points and areas of the body in the feet, hands, and ears using unique micromovement techniques such as thumb or finger walking and hook and backup to create a response throughout the body. In short, massage therapists work “from the outside in,” manipulating specific muscle groups or fascia to release tension. Reflexology practitioners see themselves as working “from the inside out” — stimulating the nervous system to release tension. Another difference between massage and reflexology is that a client will stay fully clothed for a reflexology session except for removing footwear, whereas clients remove clothing for a massage session. Where does reflexology come from? Because reflexology is an ancient practice, its origin and history is difficult to track. However, reflexology is thought to have been passed down through an oral tradition, and possibly first recorded as a pictograph on the Egyptian tomb of Ankhamor in 2330 BC along with other medical procedures. 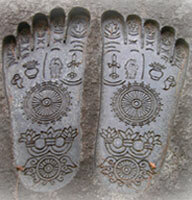 Reflexology symbols are also thought to be recorded on the feet of statues of Buddha in India and later China. The Chinese classic, the Yellow Emperor’s Classic of Internal Medicine, which was written around 1,000 BC, has a chapter on “Examining Foot Method” and is the beginning of discussions in print about the connection of life force and points and areas on the feet. It is believed that Marco Polo translated a Chinese massage book into Italian in the 1300s, thus introducing reflexology and massage to Europe. In 1582, a book on an integral element of reflexology called zone therapy was first published in Europe by Dr. Adamus and Dr. A’tatis. In the United States, William H. Fitzgerald, MD, who is frequently referred to as the father of reflexology, wrote in 1917 about ten vertical zones that extended the length of the body. He found that the application of pressure to a zone that corresponded to the location of an injury could serve as relief of pain during minor surgeries. Dr. Fitzgerald’s work was expanded by Dr. Shelby Riley, who developed a map of horizontal zones going across the body and a detailed map of reflex points on the feet and hands. He also suggested pressure points on the outer ear. Eunice Ingham, a physiotherapist who worked for Dr. Riley, is another prominent figure in the development of reflexology. 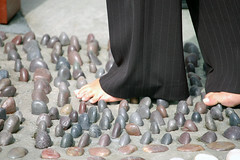 In her research with zone therapy’s pressure points, she found the feet to be the most sensitive and responsive. She developed the foot maps still in use today and introduced reflexology practices to the non-medical community in the 1930s. 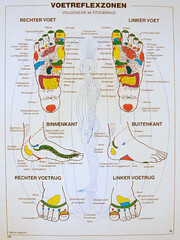 Ms. Ingham also designed one of the most commonly used reflexology charts, which has since been refined by her nephew, Dwight Byers, at the International Reflexology Institute. In 1957, Dr. Paul Nogier recorded a reflex map of points on the outer ear. His work has been expanded by Oleson and Flocco and is now being taught as part of an integrated approach to hand, ear and foot reflexology. Eriksen, L. (1992). Municipal Reflexology. Zoneterapeuten (Journal of the Danish Reflexologists Association, FDZ),6. Eriksen, L., & Levin, S. (1995). A Closeup View on Company Reflexology (Committee Report): Danish Reflexologists Association. Enersen, O. D. (1994-2007). Head’s Zones. Who Named It? Accessed May 24, 2007, fromhttp://www.whonamedit.com/synd.cfm/636.html. Frequently Asked Questions. (2007). Frequently Asked Questions Retrieved March 5, 2007, fromhttp://www.americanacademyofreflexology.com/FAQsOf.shtml#DiffMass. History of Reflexology. (2007). 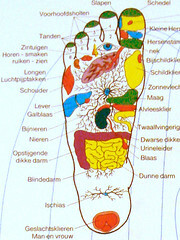 American Academy of Reflexology Retrieved March 4, 2007, fromhttp://www.americanacademyofreflexology.com/HistoryOf.shtml. He believed that certain areas on the feet and hands were linked to other areas and organs of the body. This concept was furthered by physiotherapist Eunice Ingham into the modern practice of reflexology. Practitioners believe that applying pressure to these reflex areas can promote health in the corresponding organs through energetic pathways. Dr. William H. Fitzgerald, an ear, nose, and throat doctor, introduced this concept of “zone therapy” in 1915. American physiotherapist Eunice Ingram further developed this zone theory in the 1930’s into what is now knows as reflexology. A scientific explanation is that the pressure may send signals that balance the nervous system or release chemicals such as endorphin’s that reduce pain and stress. Occasionally, people feel nauseous, anxious, or tearful, but this is only temporary and is considered to be part of the healing process. If you’re pregnant, talk with your doctor first and let the reflexologist know. The application of pressure is usually done in a circular motion, so that it may stimulate the body’s vital energy and create an overall balance. The vital energy that flows though each organ and system of the body is also referred to as Chi or Prana in Eastern medicine. All of the body’s organs and systems are connected by this vital energy. Therefore, if a particular organ is sick, one must look at the entire body to locate the cause of the illness. Numerous experiments and studies have been done on Chi or Prana energy in China in the last thirty years. The studies revealed the presence of a mixture of electromagnetic fields in the energy of the human body. Today, various tools and machines exist to measure this type of energy. More than Just a Foot Massage! 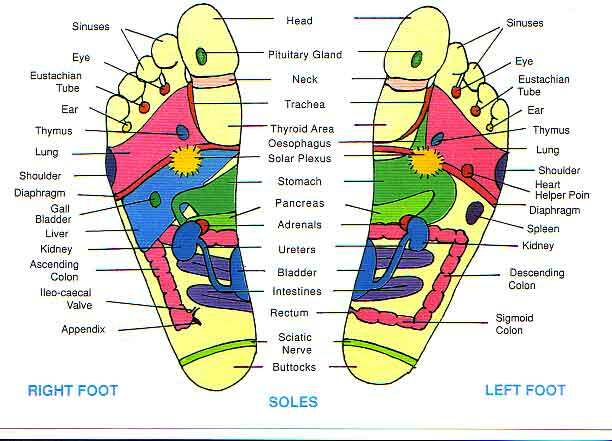 Reflexology is different from a regular foot massage because it works by applying pressure on specific areas. This implies the existence of pain in those areas, if an imbalance is present. On the other hand, a foot massage entails ‘massaging’ the feet in a way which results in a comfortable and relaxing state but which does not really deal with the symptoms of any illness or with the illness itself. Research and experience has shown that reflexology can help deal with various illnesses that a person may be suffering from. 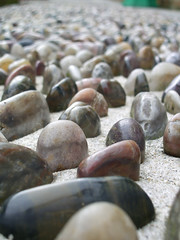 If the vital energy is out of BALANCE, there is usually either a physical or emotional manifestation of that imbalance. 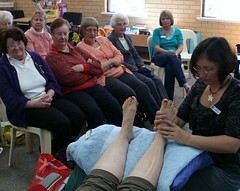 The aim is to restore this balance through a variety of ways, one of which is reflexology. As it helps put the vital energy back in HARMONY and BALANCE, it deals with the illnesses a person could be suffering from. When the body is in a balanced state, it can act in a HEALTHY manner and can react properly to anything that affects it. Part of the whole HEALING process is the ‘awareness’ that we need to develop in order to deal with a disease. Diseases develop as a result of imbalances that have existed for a long time and which have either been ignored or which we have failed to deal with properly. Therefore, AWARENESS should exist before the ailment actually turns into a real disease! Even the slightest thing, such as a headache or interrupted sleep, should be examined closely and dealt with. The key is to be aware of all our mental, emotional and physical needs. Only then, will we be able to act as defenders of our own imbalances and will we be able to remain HEALTHY. Listen to your Heart (and Body)! The next time you develop a particular symptom, stay with it and observe it. Try to find out what it is trying to tell you. Pay attention to it in a different way by listening to your mind and body. Being AWARE of your needs and acknowledging them is the first step of any HEALING process, no matter what type of therapy you choose. Take care of your emotions and your body, and you will always be HEALTHY and FIT! Confused about reflexology and whether it could benefit you in any way? Wondering if this ancient healing practice can be the key to healing your mind and body? Well wonder no more! 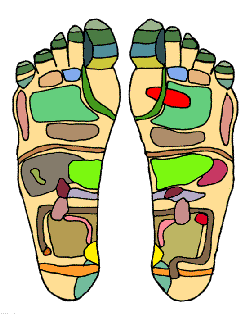 Certified Alternative Medicine Tutor Nada Rashed explores the history of reflexology, the impact that it may have on your body and how it actually works. Reflexology is an ancient healing science which dates back to the time of the Egyptian pharaohs. It has continued to develop over the centuries, with the help of doctors and healers across the world, to become the kind of practice that it is today. Reflexology is based on the principle that a complete map of the human body exists on the palms of your hands and soles of your feet. The map reflects all organs of the human body, from your head to your toe. The upper part of your foot, for instance, represents the upper part of your body which include the chest, the heart, the shoulders and partially the arms. As you go lower on your foot and hand, you also go to a lower corresponding area on your body. Dr. William Fitzgerald is an American pioneer in the field of reflexology. Not only was he was an ear, nose and throat specialist, but he was also the first one to start making a connection between applying pressure to a painful area of the body and releasing pain from that very same area. This is essentially the same concept that reflexologists continue to follow today. Dr. Fitzgerald also discovered what is referred to as ‘zone therapy’, which divides the body into equal longitudinal zones. Dr. Joseph Riley, who worked with Dr. Fitzgerald, later added horizontal zones, across the hands and feet, to the longitudinal zones. This made it easier to determine the different individual reflexes according to the ‘Zone Theory’. The difference between zone therapy and reflexology must be made clear though. 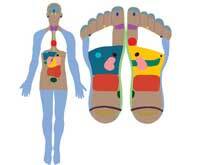 Reflexology works on the zones of the body as well as the different reflexes representing the organs. It thus works to identify the sore areas which are out of balance. On the other hand, zone therapy works mainly on the zones to determine the areas which need to be worked on. Eunice Ingham was one of the students of Dr. Riley’s zone therapy. She became the main pioneer of reflexology as it is known today. Ingham practiced on hundreds of cases before confirming that “reflexes on the feet were an exact mirror image of the organs of the body.” In her famous book, “Stories Feet Can Tell”, she recorded her cases and outlined the foot reflexes which are commonly used today. As a result of the wide range of beneficial knowledge which it contained, Ingham’s book was translated into seven different languages. During a normal session, the reflexologist applies pressure on the different points of your foot or hands which represent the different body organs. Through this pressure, and because of existing nerve endings on your feet and hands, the brain receives a signal. Upon receiving the signal, your brain begins releasing hormones such as cortisol and endorphins. The first is responsible for reducing the pain that you may be suffering from and the latter is in charge of making you feel ‘happier’ and less stressed, thus causing you to feel more relaxed after your session.